Whether it’s a special occasion, business meeting or simply a leisurely respite from a busy day, Afternoon Tea at Cape Grace is a memorable affair. Reservations for 8 or more guests would be accommodated in Signal restaurant. Black, White, Green or Herbal, there is a tea suitable for every palate. Don’t forget to try our locally-grown Highland Rooibos. Known as the Red Gold of South Africa, this caffeine-free, sweet herbal tea is packed full of healthy antioxidants. If you’re looking for something a little lighter, our Cream Tea is just the ticket. Bite into warm scones topped with generous dollops of butter, jam and clotted cream, and enjoy a pot of coffee or tea for R90 per person. Our tempting selection of daily prepared cakes, visible upon entrance to The Library, are also available at R60 a slice. 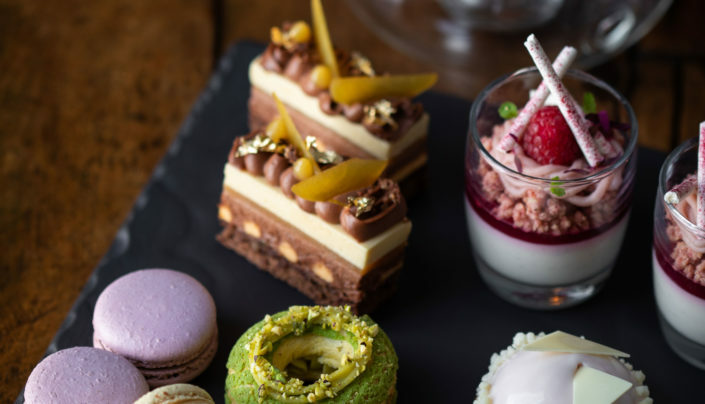 With cream cheese and cucumber finger sandwiches, irresistible macaroons, crumbling scones served with lemon curd and strawberry jam, our time-honoured, traditional Afternoon Tea is the ultimate luxury. Your individual menu will be paired with fragrant coffee or perfectly brewed infusions of loose-leaf tea served in dainty glass teapots. Opt for a sparkling glass of local Méthode Cap Classique or French Champagne for an added touch of extravagance and while away your afternoon in true Cape Town style. Full Afternoon Tea is priced from R225 per person.